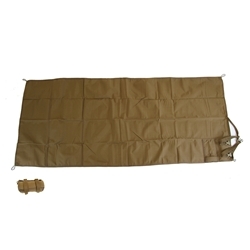 Size is 72" x 30"
Rolled up size approximately 4" x 8"
A lightweight, easily packable mat to keep you off of the dirt, mud, and wet ground. The back of the mat has a urethane water proof coating. The top has a DWR coating. You can stuff the mat inside your pack or easily strap it to the PALS webbing on the outside. There is a 12" wide section of closed cell foam for elbow protection and comfort when on hard surfaces.